There's a whole new view of Lake Superior. Now you can look out across the bottom of the big lake, and even count the fish swimming by, without getting wet. The "fishcam" went on line Friday, broadcasting to the Internet from 35 feet down. Researchers say it's the only permanently mounted underwater camera in the world sending live images back to shore. 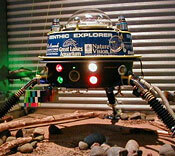 This replica of the Benthic Explorer is on display at the Great Lakes Aquarium in Duluth. The real Explorer is anchored to the bottom of the lake in 35 feet of water, just a few miles north of Duluth. The Explorer is visible on the fishcam image screen. A TEAM OF RESEARCHERS PUT THE CAMERA UNDERWATER more than a year ago, several miles north of Duluth. The researchers have watched pictures from the "fishcam" for months, but now, anyone with a computer hooked to the Internet can get a scuba diver's view of the bottom of Lake Superior. The research team gathered at the Great Lakes Aquarium in Duluth to unveil the "fishcam" website. Fish expert Greg Bambenek has had the fishcam hooked up the computer at his house. At the aquarium, he watched the fishcam on the screen of a laptop. "That's streaming out on the web right now," says Bambenek. "It's updated every 10 seconds. The fish there are mullet. At night, we have a micro-cam that brings the zooplankton into close focus, and at times you'll see the mullet eating the zooplankton." Bambenek says zooplankton are tiny crustaceans, fractions of an inch long - far too small to show up through the standard daylight lens. But Bambanek says it's a different story at night. When the fishcam switches to its magnifying lens, the computer screen comes alive with little critters. "Leptodora is the large one. Then you'll see little copepods that kind of look like Pokemon creatures with the antennas coming off their head, and they're smaller. They're only a couple millimeters, so you wouldn't be able to see them if you were diving in the water.," says Bambenek. The people gathered to see the fishcam's first Internet images had to settle for a murky picture. A strong northeast wind was blowing in off the lake, kicking up big waves, and stirring up the bottom. Greg Bambenek says big waves make for blurry pictures. Even so, lots of fish were visible in the frame. Some of them were ruffe, a non-native species that's invading the Great Lakes. Bambenek says researchers were surprised to see so many ruffe here, six miles from Duluth. They thought the fish stayed closer to Duluth Harbor. Bambenek says that's just one example of the valuable information scientists can get from the fishcam. "We can take a freeze-frame, count the number of zooplankton, count the number of fish. We look at it over time, and see what does a northeaster do? What do the fish do? Do they leave? Do they come back? What does water temperature do? We have a temperature sensor down there. We also have a hydrophone so we can hear what's going on underneath the water," he says. Bambenek says the research team learned a lot during the year it took to get the fishcam up and running on the Internet. He says the team is planning to put another camera in Lake Superior, farther from shore, and hoping to put a third camera somewhere on the ocean floor.